A little known fact about me…not so little known if you are my husband…or read my blog…or…ok…forget it…the well-known fact is that I can be a little obsessive. A friend once said I am like a duck…calm, collected on the outside and paddling like crazy underneath. I choose to take that commentary as a compliment rather than what it probably is…constructive criticism. Hyper-vigilant is what we therapists sometimes call it. When referencing myself (insert chuckle) I like to call it being proactive. In my mind I hover…circling issues and situations on an almost constant basis with the goal of preemptively working to keep all stress at bay. The irony…the incredibly predictable, obvious irony…is that all of my preemptive, proactive, hyper-vigilance…well, it causes STRESS. You know, that thing I am trying to avoid. My hovering gets lower and my circling gets tighter and faster when I approach periods of transition. This self-revelation is helpful…except that when you get into adulthood long enough, you look back on the landscape of life, and you realize that life is just a series of transitions. Change…that takes place slowly or quickly…that is expected or sneaks up on you…over and over and over again. 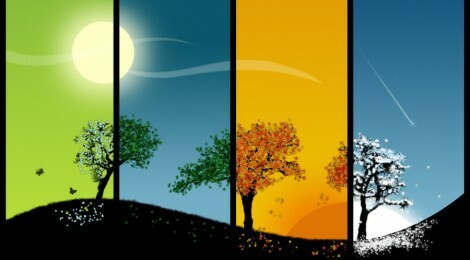 Like the seasons. The school year ended today and summer has officially arrived at our house. This change means kids at home, camp schedules, later nights, lightening bugs, bike rides, icees, tennis, play dates, the beach…all wonderful, sun-derful things that I crave with my kids and husband. Still, like clockwork, about two weeks before this day arrives I start to circle, begin to hover. How will I keep up with my work? How will I keep the house clean? How will I make the most of the summer days AND keep all of the balls in the air? I’m hovering, hovering, circling, circling when I find myself home with Emmett on Monday morning when he doesn’t have preschool…my last morning alone with him and Hillary before the girls are out of school. Something snaps or clicks or aligns in my mind’s eye and I grab a poster board we have left over from a school project. I call Emmett into his room, flip over the poster board, and pull down his crayons. I tell him what we are doing. 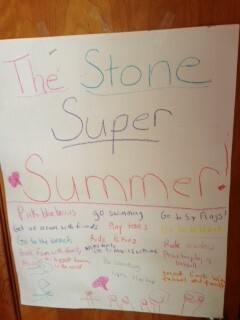 Almost feverishly, with some desperation, I write “The Super Stone Summer” on the top of the paper. I tell him…this is going to be our wish list of experiences for the summer. He starts calling out things he wants to do. Bike riding. Swimming. Play baseball. Play tennis. Ok. I draw a heart. That’s when it happens. The break. The release. The surrender. The trust. The joy gushing in. And, I remember. These seasons. They have never failed me. Ever. Perfect? Never. But, failed me? No way. The work gets done. The tasks completed. Or not. But it seems not to matter much in the end. The only real struggle is the one inside of me…the struggle to embrace the season for what it is. For You created my inmost being; You knit me together in my mother’s womb. Your eyes saw my unformed body. All the days ordained for me were written in your book before one of them came to be. The seasons have never failed me. Recently some transitions have sidled up to me…like how the last day of school does each year…like the little girl who started kindergarten yesterday, but tomorrow, it seems, is getting ready to start middle school…start high school…start college…get married…have her first baby. Slow and sneaky, then lightening quick, those transitions are at times. I’m hovering, hovering, circling, circling trying to make sense of the change and trying to grasp this sand slipping through my fingers…almost feverishly, with some desperation. Then I recognize it. God’s leading…to look back. I see it. The proof. The invitation…to release. To surrender. To Trust. And, that’s when it happens. The joy gushing in. Because you see, I look back, and I know, I recognize, that the seasons…they have never failed me. EVER. The only real struggle is the one inside of me…the struggle to embrace the next season for what it is. There is a time for everything…a season. Amazing timing. I paused from all this packing to read this! I’m in the middle of moving. Kelli, Isn’t that kind of thing amazing? I find that I read precisely what I need to read when I need it. Otherwise, my interest is just not there. So glad you could relate and appreciate it. We love you! I love watching God’s hand on your life from afar. On to your next adventure! He sure keeps sustaining you!